Trentino-Alto Adige has a wild and rugged landscape, rich in mountains, lakes and forested lands. it does not fit most people's vision of Italy, because it feels more like Austria. It borders Austria and Switzerland to the north, and the region was actually ruled by the Austrian Empire for some 400 years, and was part of Austria-Hungary from 1815 until 1919, when it was annexed into Italy. The southern province, Trentino (Trento), borders the Italian regions of Lombardy and Veneto. It is more typically Italian, and the majority of the natives are Italian speakers. The mountain areas are rife with castles and fortified towns. The Brenner Pass through the Alps long made this a region of vital strategic importance, as all trade between north and south once depended on the pass. Thus many fortresses and castles were built in the surrounding mountains to defend the pass. Today, the mountain areas offer excellent winter skiing facilities, particularly in the Gherdëina (Gardena) valley. The region has a reputation for wine-growing, especially whites and aromatic wines. 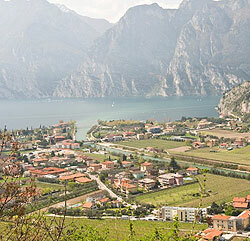 Trentino, the southern province, is also known for the production of reds and sparkling wines. But the region actually grows only one percent of Italy's wine production. It does, however, produce 10% of the country's grappa, a traditional Italian drink similar to vodka. Trento lies in a beautiful valley surrounded by majestic mountains dominated by Mount Bondone and Mount Paganella. The town is especially pretty in spring when the apple trees are in full blossom. Trento's historic medieval city centre is interesting, with buildings that fuse elements of Italian Renaissance and Germanic styles. The Piazza Duomo is lined with Renaissance buildings covered with outdoor frescoes. Via Belenzani is a street of elegant Venetian-influenced palazzi. Trento has long been a town of elegance; from the 12th to the 19th century the Prince-Bishops of Trento lived and built their luxurious manors here. The stately, castle-like Palazzo Pretorio served as the main residences of the powerful bishops. The Prince-Bishops also commissioned the building of fine churches, including the Renaissance-Gothic Santa Maria Maggiore. Today, Trento is an affluent town, with some of the highest property prices in Italy.